THE HARBINGER: PROPHETIC FACT OR FICKLE FICTION? Here at Apprising Ministries I do my best to monitor Intel along this Internet Front and report back what I’m seeing as an assist to local pastors bombarded with all kinds of things and who just don’t have this kind of time. The Harbinger is one of the hottest selling books today. It is a quasi-fictional story reminiscent of novels such as The Da Vinci Code or The Shack. Each of these books involves mystery and intrigue, and has a serious message that the authors want to convey. The Harbinger’s prophecy relates to and grows out of what the author calls “The Isaiah 9:10 Effect.” (TH, 131-144) In this biblical text describing the divine judgment that befell ancient Israel, Isaiah states: “The bricks have fallen down” (Isaiah 9:10a, NASB). With the prophet’s description of destruction, Cahn sees a mysterious connection to Ground Zero’s rubble after the terrorists destroyed the World Trade Center on September 11, 2001. From “The Isaiah 9:10 Effect” stem nine prophetic warnings or harbingers for America. Also key to the narrative Cahn creates is ancient Israel’s response to God’s judgment. Arrogantly and defiantly, the nation asserts: “But we will rebuild with smooth stones; / The sycamores have been cut down, / But we will replace them with cedars” (Isaiah 9:10b, NASB). Again, it’s not my intent to present an apologetic here. What I wish to do is to give you this quick overview and then bring to your attention what I think is a critical issue concerning Jonathan Cahn and his writings in TH because tonight he appeared on Glenn Beck TV. You can see the program below but no doubt this appearance by Cahn will stir up even more attention within Christendom for his TH. Returning to the idea of TH warning that God’s judgment is imminent unless she repents I point you now to another review. Now, if this was all there was to it, I would be the first to help advance the need for people within the United States to turn from their sin and to the Gospel of repentance and forgiveness of sins in Jesus Name. While the nation cannot repent, individuals within sure can. because of serious flaws throughout the book, the potential dangers may well outweigh the benefits. Many of the author’s views and ideas as presented in The Harbinger are misguided, having both significant exegetical and theological problems. Additionally, the book could well leave its readers with serious misunderstandings about how to appropriately interpret and apply the Word of God. Beyond this, it is also problematic because in trying to support his conclusions, Cahn appears to variously overstate his case, see prophetic fulfillment where arguably none exists and presses details to draw parallels between historical events beyond what the facts reasonably support. 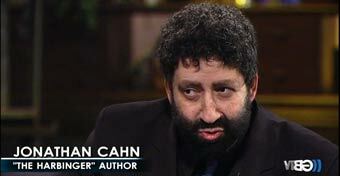 This brings me to the critical issue I spoke of earlier: Is Jonathan Cahn trying to have his cake and eat it too? In other words, is TH really prophesy or is it fiction? He cannot have it both ways, which it appears to me he is trying to do. Allowing himself to be portrayed a prophet but leaving an escape hatch open by also claiming fiction. Hidden in an ancient biblical prophecy from Isaiah, the mysteries revealed in The Harbinger are so precise that they foretold recent American events down to the exact days. The revelations are so specific that even the most hardened skeptics will find it hard to dismiss or put down. It sounds like the plot of a Hollywood thriller with one exception… IT’S REAL. So, which is it? 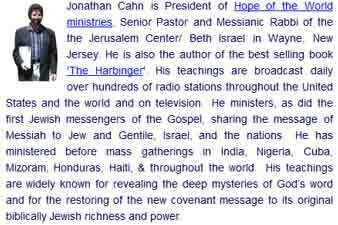 Are we being given a binding prophesy; or are we just being titillated by some story Jonathan Cahn has dreamed up? I’ve seen him on a number of programs and before I leave you with his appearance with Glenn Beck tonight I’ll give you an illustration for you to compare with it.